The eight-story, 628,000 gross square foot Jacobs School of Medicine and Biomedical Sciences includes state-of-the-art laboratory space; an expanded patient care simulation center for clinical, surgical and robotic surgery training; and administrative offices. The Niagara Frontier Transportation Authority Metro Allen/Hospital station is integrated into the building, providing a direct connection to public transportation and easy access to downtown Buffalo and UB’s South Campus. • Creates state-of-the-art learning and research facilities that will encourage prospective students to study—and eventually practice—in Buffalo. • Attracts world-class faculty to teach tomorrow’s practitioners, and to pioneer new medical treatments and technologies. • Improves patient care in the region through the availability of much-needed clinical services as well as innovative treatments. • Increases the school’s enrollment, thus training more physicians, especially in high-demand specialties such as: cardiology, endocrinology and biomedical informatics. • Grows the university’s presence in downtown Buffalo and promote more collaboration with partner institutions on the Buffalo Niagara Medical Campus. On October 22, 2013 Governor Cuomo announced the groundbreaking of the new UB Medical School. A major milestone of the new Jacob's School of Medicine and Biomedical Sciences was celebrated on March 22, 2016 when Governor Cuomo signed a steel beam that was raised and placed atop the eight-story, 628,000-square-foot facility. The medical school had its official opening on December 12, 2017 with the first set of students beginning at the school's new downtown location in January of 2018. The $375 million school is a significant part of the Buffalo Niagara Medical Campus, linking with Buffalo General, the Gates Vascular Institute, Roswell Park Cancer Institute, the new John R. Oishei Children's Hospital. The medical school opened its door to its first students in the spring semester of 2018. 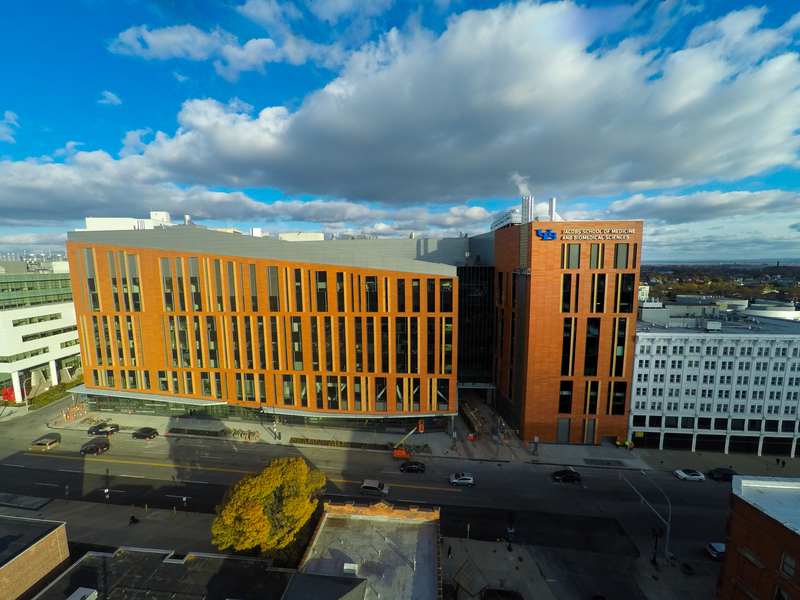 A key facet of the Buffalo Niagara Medical Campus, UB joined with prestigious research and clinical partners to create the region’s first comprehensive academic medical center. The new building allows UB to expand its medical school class size from 144 to 180 students.